Silver Street has been known by several names in the past; St John’s churchwardens’ accounts from the sixteenth century refer to it as Stairs Hill alluding to the steps in the churchyard wall giving access to the churchyard from the street. The original steps were lower down the hill, closer to the church, and a slight recess in the wall indicates their former position. Indeed at this point are two date-stones, the first of 1621 refers to the major rebuilding of the churchyard wall and slightly below it the date-stone of 1886 refers to when the steps were blocked up and the present steps, further up towards the Borough, were installed. 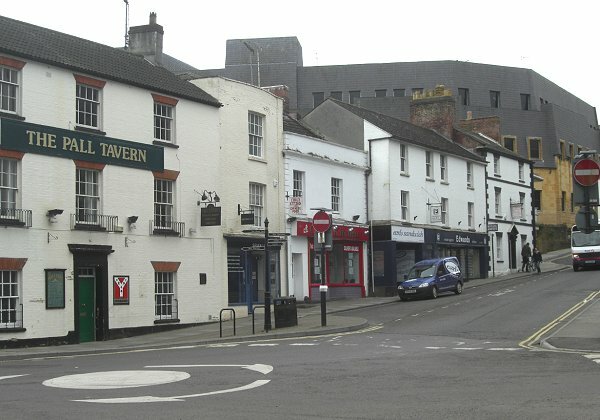 It is said that a road called Silver Street often alludes to water, and in Yeovil’s case the Rackel stream created a shallow ford across the road, just outside the Pall Tavern, as it flowed into the Horse Pool by the side of the inn. The other side of the shallow ford the road was at one time known as Ford Street, a deed of 1355 referring to it called it "a street named Ford Street in Kingston" (that is, the Manor of Kingston). Later it became known as Rackleford or Reckleford and finally today's Market Street. In the 18th century the top part of Silver Street, from the Borough as far as Vicarage Street, was often referred to as Cornmarket, alluding to the transactions that took place there on market days before the Corn Exchange was built behind the Town Hall in High Street. Until the early 19th century a row of small dwellings, little more than shacks, were built up against the wall narrowing the roadway considerably. “The churchwardens appear to have received 6s. from six persons, for houses resting on the church yard wall, in 1706; but from 1708 to 1741, 9s. per annum appear to have been received from Edward Phelips, and Madam Phelips, and then ceased. The site upon which these tenements stood is a narrow strip of land, bounded on one side by the church-yard wall, the other being open to the street. At one end of it is a flight of steps leading to the church-yard ; at the other a public well, called Nuns' Well. The buildings on this land consisted of two pent-houses and a blacksmith's shop, which, becoming in the year 1806 very dilapidated, were taken down by the Rev. W. Phelips, who was lord of the manor, and the materials given away.” (Vickery, 1856). 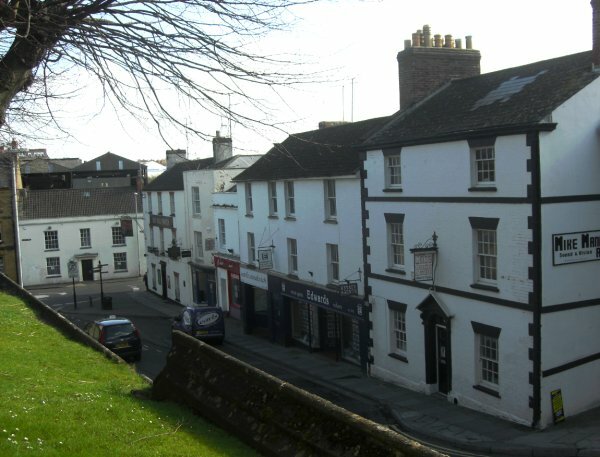 One of these buildings appears in leases dated 1668 and 1771 and is referred to as a burgage called "Cold Harburrough over against Broad church steps". In 1835 a fire that started in the King’s Arms destroyed the building along with several other premises. 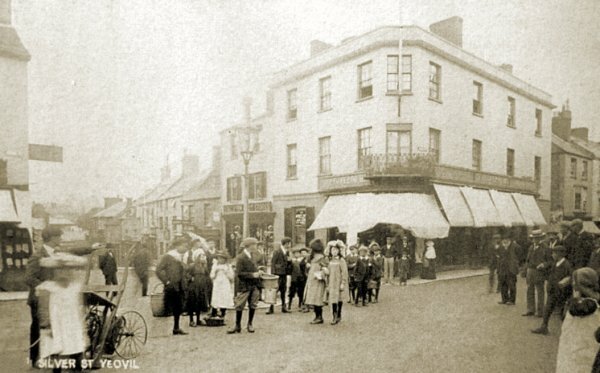 Following the fire all the premises from the King’s Arms to the Pall Tavern (there is a date-stone of 1836 on the corner of the Pall Tavern) were rebuilt further back from the road so that Silver Street could be widened thereby easing congestion in the centre of the town. Silver Street also had a third public house - the Half Moon Hotel. Many thanks to Ron Hilborne for the following - "The Horse Fairs were also held in Silver Street. Their tails were all decorated and the sellers would run them up and down the road to show potential buyers what magnificent beasts they were." 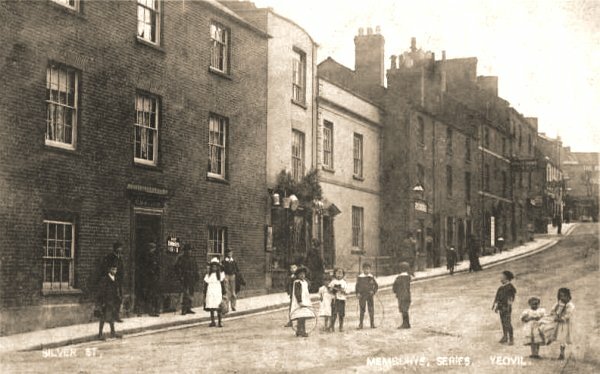 This photograph was taken around 1900 from the Borough, looking towards the junction of Silver Street at left and Middle Street at right. The large building on the corner was London House which belonged to Thomas Thorne, a Draper. It was demolished and replaced with the current bank building, Going down Silver Street was a boot stores, a greengrocer and then the Half Moon Hotel. Taken about 1960, this photograph is taken from the top churchyard steps. 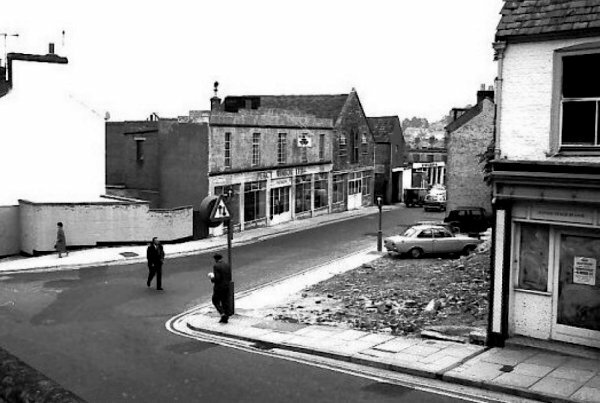 The row of shops at right have all disappeared with the building of the Quedam shopping centre. 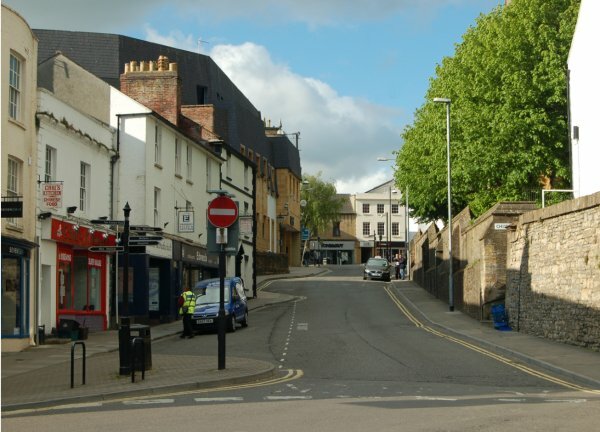 The entrance to Vicarage Street, another casualty of the Quedam, is just visible at centre, between the white building in Court Ash and the man walking along the pavement. A postcard showing Silver Street as seen from the second floor window of today's Superdrug building. The card is postally unused but I'd guess dates to the late 1960s or early 1970s. This photograph was taken from the churchyard about five years later and shows Silver Street along the bottom with the junction of Vicarage Street. 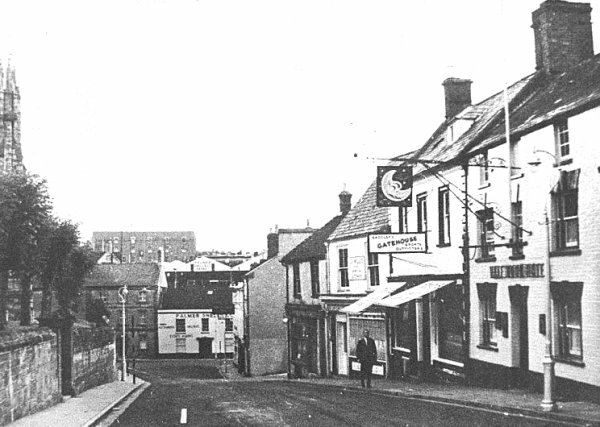 Buildings have been demolished either side of the junction and the white building at left is the King's Arms. Compare this with the photo below taken in 2013. The same view as above but taken in 2013. 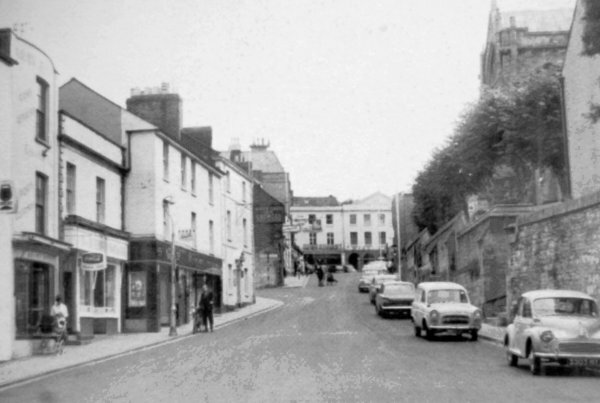 Just a few yards further up and dating to about 1965, this photograph is taken from the bottom of Silver Street looking up towards the Borough. 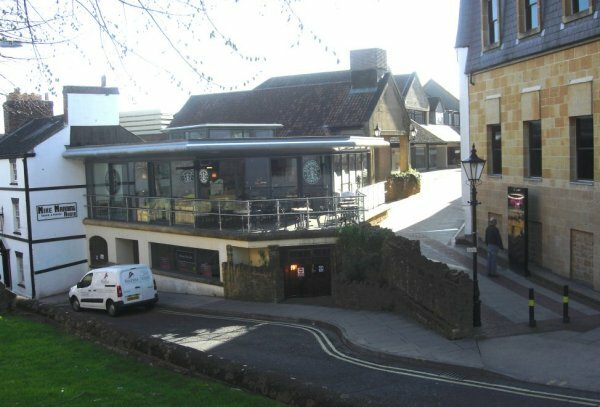 The junction of Vicarage Street is seen at left, about halfway up. 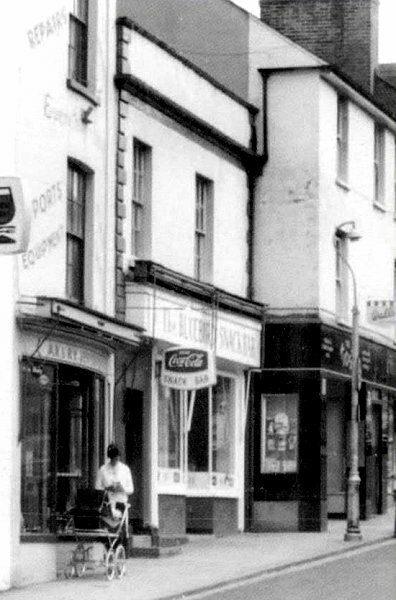 An enlargement of part of the previous photograph showing the Bluebird Snack Bar - well remembered by many Yeovilians. The same scene in 2013, little changed except for the proliferation of street furniture and, of course, the massive structure of M&S. .... and seen from a slightly different angle in 2013. At least this scene has changed little since the rebuilding of these buildings from the King's Arms to the Pall Tavern following the fire of 1835, apart from changes of occupiers and modern traffic. Photographed in 2013 from St John's churchyard.